The castle was the first castle to be mainly owned by Lord Hashiba Hideyoshi. 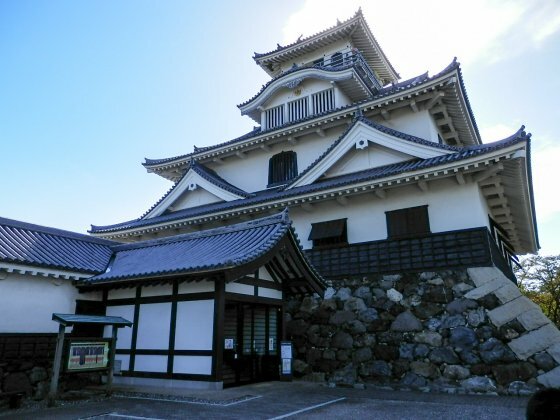 There are various seasonal exhibitions on the 2nd and 3rd floors of the Nagahama Castle Historical Museum. (Admission: 400 yen). The museum will be closed between December 2015 and February 2016 for renovation. 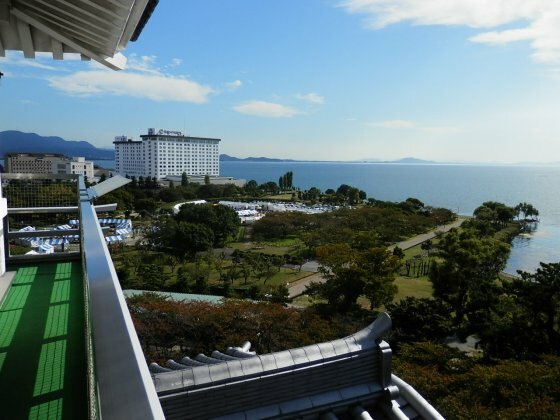 A splendid view of Lake Biwa can be enjoyed from the observatory on the 5th floor of the Nagahama Castle tower. Lake Biwa is the biggest lake in Japan. The entire Chikubu Island is known for being a strong power spot. 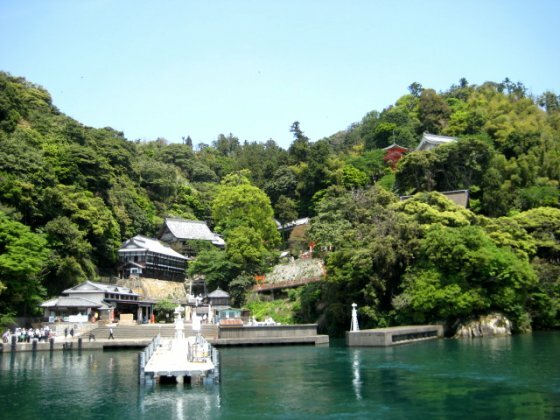 It is considered to be the God's island, where the Hogonji Temple and Tsukubusuma Shrine are situated. The magnificent sunset with Lake Biwa as the background is chosen as one of Japan's 100 Most Beautiful Sunsets. 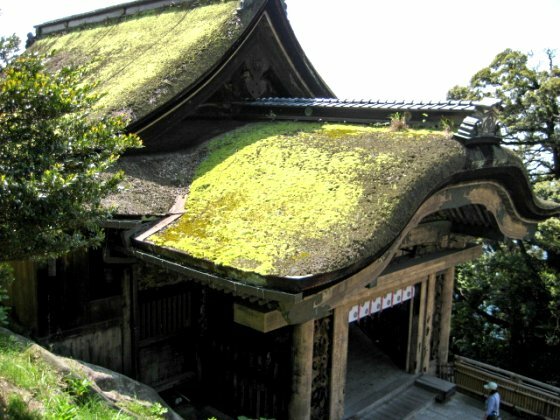 The Hogonji Temple in Chikubu Island was built in 724 by the order of the then Emperor Shomu. The emperor received a divine prophecy from the goddess Amaterasu Sume Okami as follows. "The small island in Lake Biwa is the goddess Benzaiten's sacred place. You must build a temple there, which will bring about the state's peace and prosperity, huge harvest, and people's prosperity." Emperor Shomu sent a Buddhist priest Gyoki as an Imperial messenger to have the temple built. 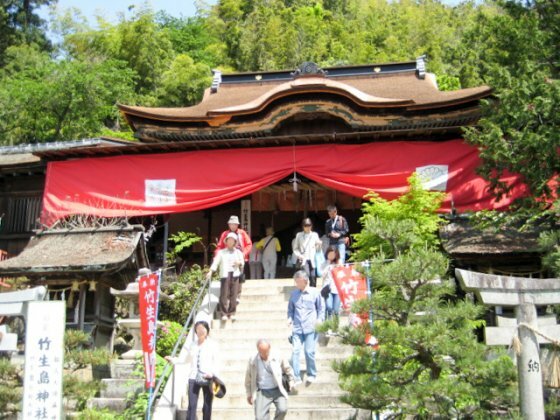 The picture above is the Karamon entrance of Hogonji Temple. There are also several other important cultural properties in the area. 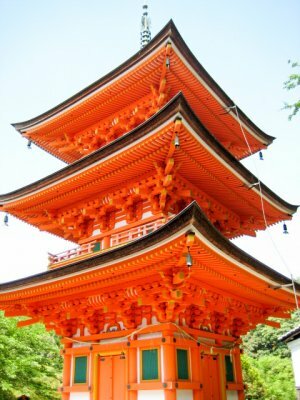 The vermillion three story pagoda was burnt in a fire during the Edo period, and was later reconstructed. Corridor which is believed to have been constructed by flipping over Toyotomi Hideyoshi's vessel. 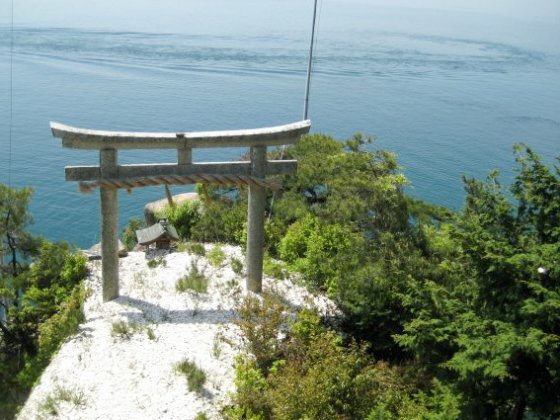 Tsukubusuma Shrine is the Lake Biwa's Protecting God, which enshrines the Azai Hime no Mikoto. 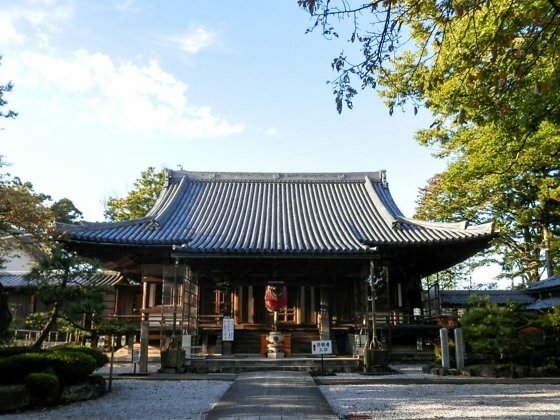 The present main hall was rebuilt during the Sengoku period (16th century) and is designated as a national treasure. 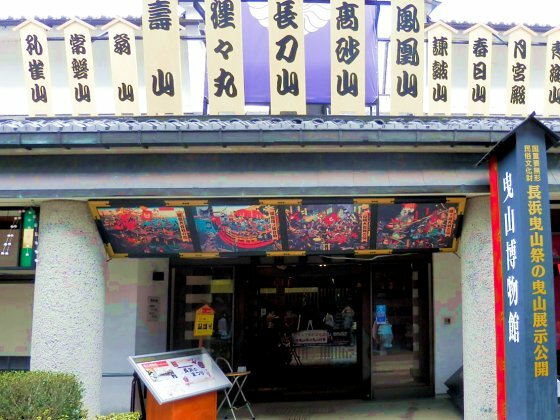 Try the "Kawarake Nage" here. 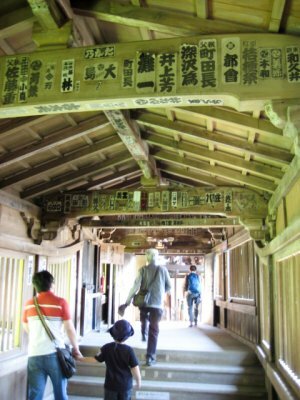 Buy a piece of unglazed earthenware called "kawarake" (300 yen), write down your wish, and throw it toward the Torii (shrine gate). 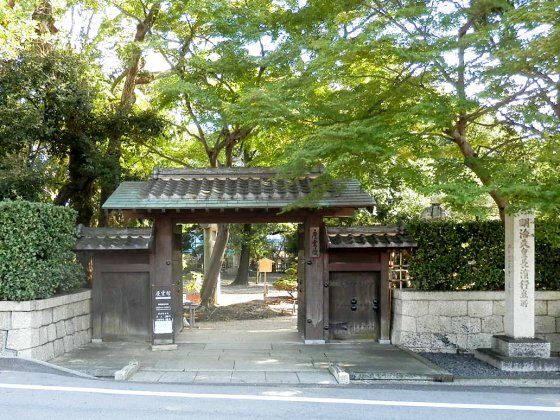 It is said that your wish will be fulfilled if the "kawarake" passes through the gate. The image of Meiji period still remains in the old-modern atmosphere of Kurokabe Square (black-walled square). 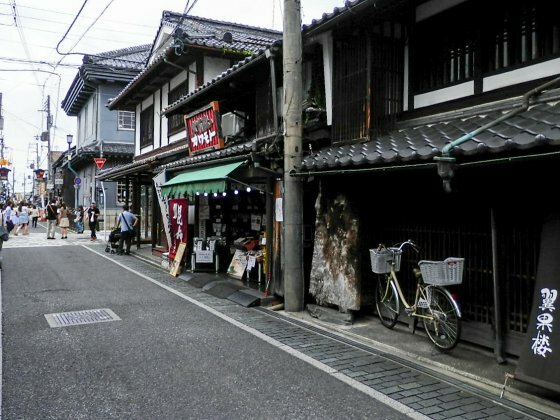 The area used to prosper as a temple town of the Daitsuji Temple and the post-town along the Hokkoku Kaido. A bank was established in year 1900 (Meiji 33). Later, the town gradually developed with black-colored architecture. Today, it has turned into a busy and fun walking area full of tourists and local people on weekends. Glass artworks are available at the Kurokabe Glass Museum. The museum was built in 1989 by reusing the wooden architecture of the bank which was constructed in 1900. 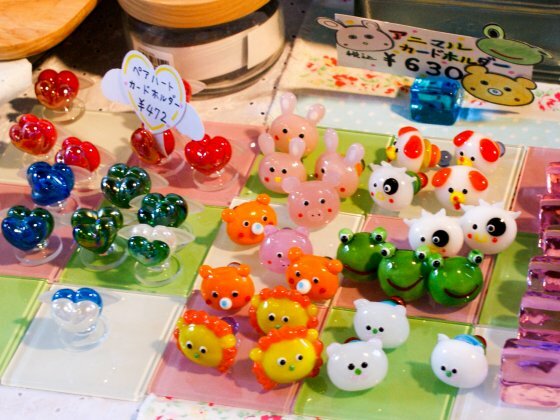 Inexpensive small glass artworks can be found at the Kurokabe Glass Museum. Adorable card holders in the picture are available for a reasonable price. 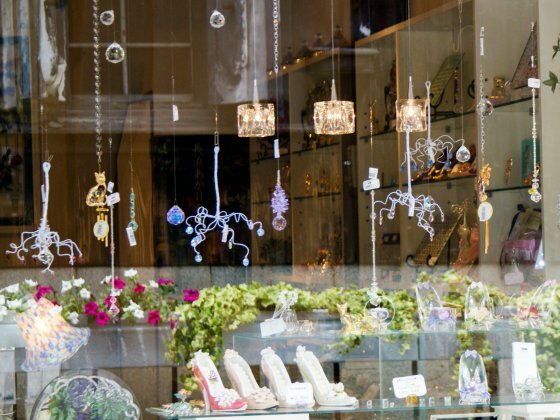 There are also shops that deal with glass craftworks and antique products. 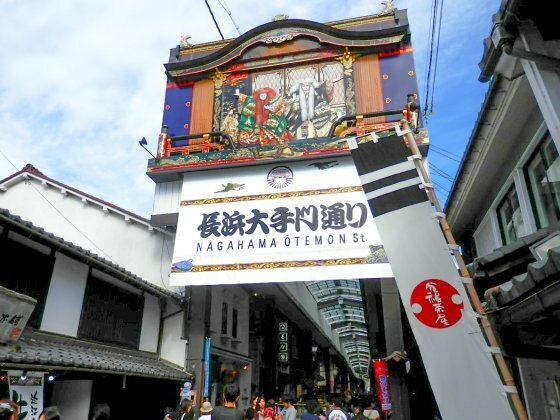 Nagahama Otemon Dori Shopping Street is a commercial avenue with an arcade which extends from Kurokabe Square. Various souvenir shops and restaurants can be found along the avenue. The Kaiyodo Figure Museum which a figure doll fan will gloat over, is also located in this shopping district. The Nagahama Hikiyama Festival is held for a week in April every year during the Nagahama Hachimangu Shrine's Spring Ritual Festivals. Its origin dates back in the 16th century. The actual Hikiyama (festival floats) used during the festivals can be observed at the Nagahamashi Hikiyama Museum. There are also many places to see in the neighboring areas of the Kurokabe Square. Following spots are worthwhile visiting. 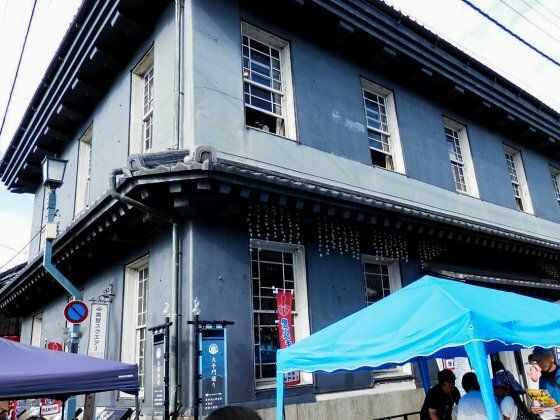 Nagahama Railway Museum (300 yen) where you can have a look at a display of the currently existing Japan's oldest station building (1882, Meiji 15). 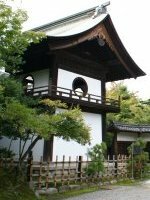 Keiunkan (picture and admission: 300 yen) which is a guest house used during the Meiji period and named by Ito Hirofumi. The Daitsuji Temple (500 yen), a branch temple of the Higashi Honganji Temple in Kyoto, is a good place to see as the main hall is designated as an important cultural property. 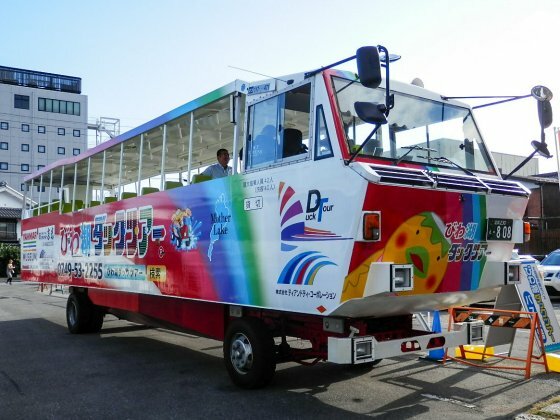 How about a cruise on the Lake Biwa riding an amphibious vehicle that departs from a terminal in Kurokabe Square? The vehicle will make a round trip and bring you back to terminal. Tour for adult: 2,800 yen. 45 minutes. Advance reservation required. 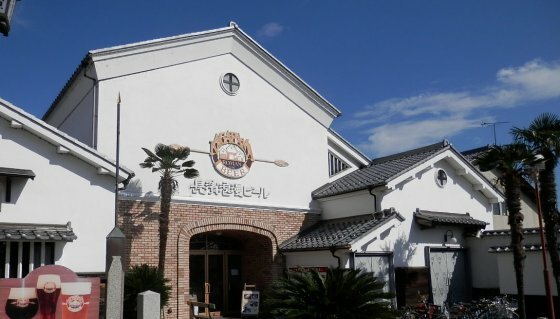 The Nagahama Roman Beer is a recommendable craft beer brewery. There is a restaurant inside where you can quench your thirst with a freshly-brewed draft beer and enjoy original culinary dishes. Both individual groups and big groups (up to around 40 people) can fit. Four different draft beers are available. Tasting (380 yen for 150ml) is available. Try them to find out your preferred taste. 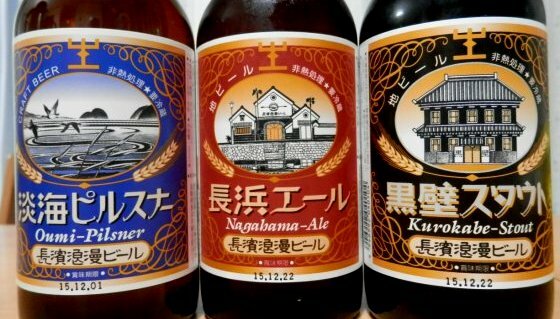 Bottled beers in the picture can be bought as souvenirs too (491 yen per bottle). 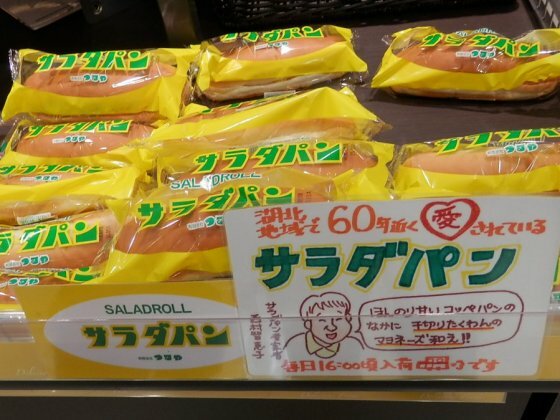 One of the typical cheap yet delicious food well-known only among the local is the Tsuruya's salad bread (134 yen per piece). What do you think is stuffed into the bread? Shredded pickled radish blended with slightly sweet mayonnaise. You might think it is an odd combination, but have a bite and you will find out its perfect taste and texture. 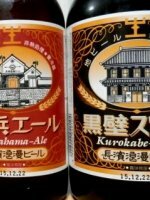 They are sold in limited areas including the Heiwado supermarket in front of Nagahama station. 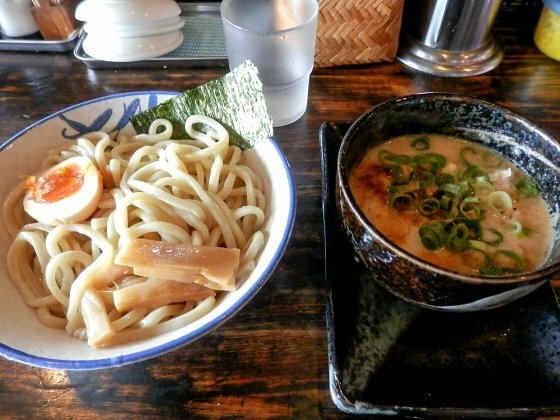 "Johnny" a ramen noodle shop in Takatsuki-cho is famous for its Kotteri Tsuke-men noodles (830 yen). The fat and chewy noodles with a dense and tasty soup make a perfect match. Remember that the store is not in a walking distance from Kurokabe Square. Time: 10 minutes, 240 yen for one way.